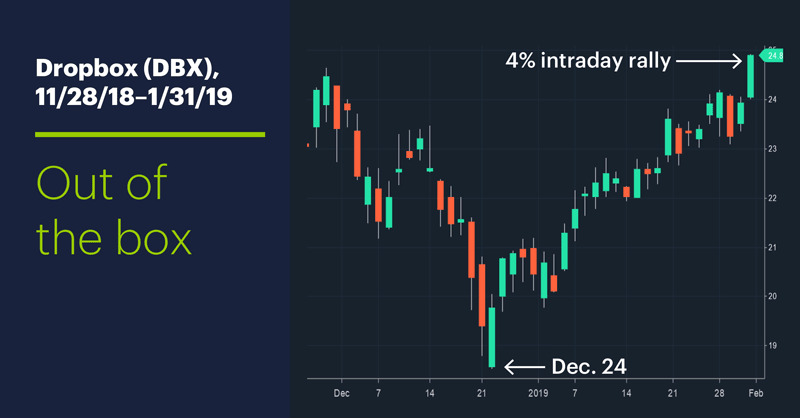 Even in the afterglow of Wednesday’s rally-inducing FOMC announcement, Dropbox’s (DBX) 4%-plus intraday jump yesterday morning was attention grabbing. There weren’t any apparent headlines driving the move—the cloud-platform company was three days removed from any notable news, and its next earnings announcement was more than three weeks away. Nonetheless, a little digging revealed a great deal of action around Dropbox. 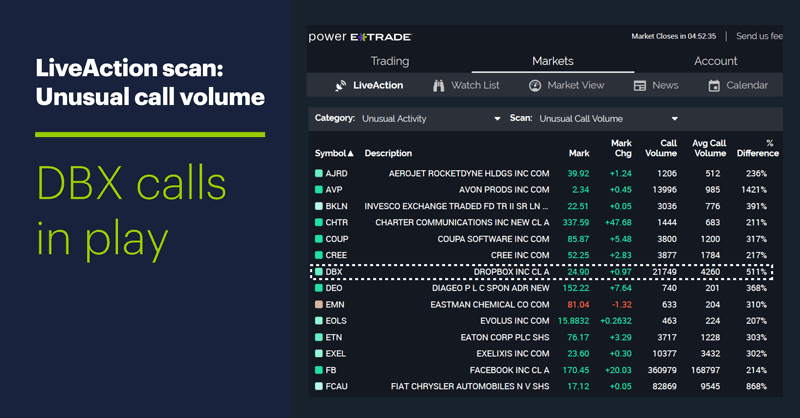 First, Power E*TRADE LiveAction scans showed DBX call options volume was more than five times average in early trading (below). Also, options open interest was increasing, which suggested traders were establishing more new positions than closing existing ones—i.e., people getting into the game rather than out of it. Then there’s the earnings component. Because Dropbox is only just coming up on its one-year anniversary as a publicly traded company, one chart can tell the stock’s entire story, from its March 23, 2018 IPO (when it closed at $28.48) to yesterday’s 4% rally to around $25. In between the stock rallied as high as $43.50 and fell as low as $18.50 on December 24. Along the way there have been three earnings releases (May 10, August 9, and November 8, 2018), with the next one currently scheduled for February 21. The stock has recently gotten some analyst attention for its bullish potential going into earnings,3 and the chart—while admittedly containing a scant three examples—shows the stock has indeed rallied into its quarterly numbers (more so for the last two), and dropped immediately after them. So, short-term traders could be eyeing the possibility of opportunities on both sides of the market. Market Mover Update: Facebook (FB) surged more than 12% yesterday after its positive earnings surprise. 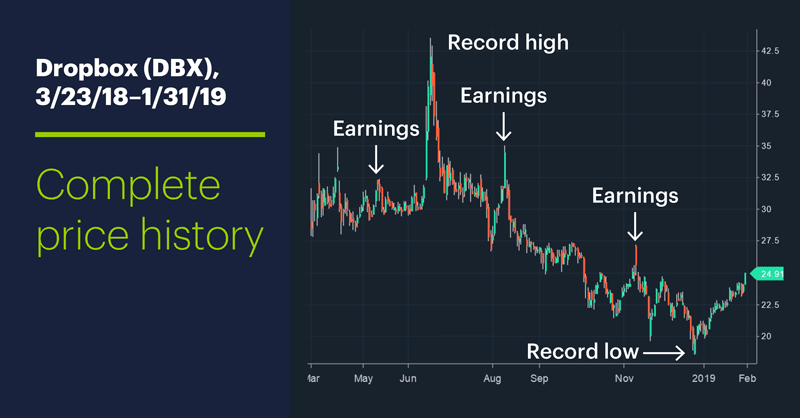 Starbucks (SBUX) hit its October 2018 resistance level in establishing a new all-time high. Today’s earnings include: Chevron (CVX), CIGNA (CI), Dominion Energy (D), Exxon Mobil (XOM), Honda Motor (HMC), Merck (MRK), Sony (SNE), Spirit Aerosystems (SPR), Weyerhaeuser (WY). 1 TechCrunch.com. Dropbox snares HelloSign for $230M, gets workflow and e-signature. 1/28/19. 2 Nasdaq.com. Dropbox, Inc. Institutional Ownership. 1/31/19. 3 Kiplinger.com. RBC Capital: 5 Tech Stocks to Buy Before Earnings. 1/30/19.